A glimpse of this motorcycle is very similar with a long snout reptile. This motorcycle is equipped with a tank up to the stern as finished entities, while supporting the long front wheels like a reptile snout. If viewed more closely and carefully, this motorcycle also paired leaf springs are mounted upside down and car-style steering system. 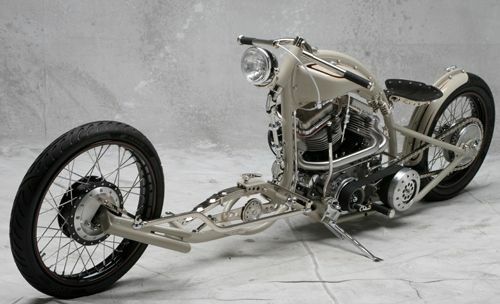 This unique and weird custom motorcycle was built by Christian Dotson called 'Swingshot'. For front legs, the suspension handle is made with an angle of 30 degrees. This is the key why the suspension of the motorcycle as agile and alert and responsive to absorb shocks, especially for long reptile stylized motorcycle. To built the motorcycle takes up to 14 months because it wanted to retain the impression of vintage, but also exploratory in this work. Explorative points it would have clearly seen how the steering system of the motorcycle. On the other hand, this reptile motorcycle engine is the result of Accurate Engineering custom-made with a basic model of Harley-Davidson's Panhead engine. Engine power is transmitted to the wheels through a 5-speed kick transmission system. 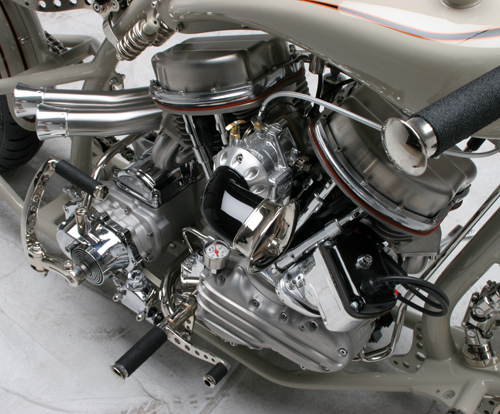 To reinforce the impression of vintage necessarily make almost all the pieces of the body of this bike, including exhaust and suction, horn, tank, fender, handlebars, steering gear, fuel lines, footing, seats, suspension, and electrical systems. Actually, there's more. 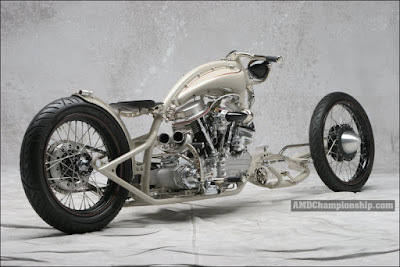 Which makes this bike unique is because the custom motorcycle rely on the brakes on the rear wheels. It is very dangerous indeed because due to the power interruption be not optimal.